作者: Nasir Aijaz on 23 June , 2015. Amidst the challenges of maintaining security and political stability, the two all weather-tested friends – China and Pakistan are set to revive ancient silk routes linking Kashgar to the warm waters of Arabian Sea at Gwadar under China-Pakistan Economic Corridor (CPEC) project, an ambitious effort by the two countries that will lead to greater investment and rapid industrialization of Pakistan on one hand and ensuring Chinese access to the warm waters on the other to address its strategic concerns. Gwadar is a deep-sea port in Balochistan province of Pakistan and would be the major destination in the China–Pakistan Economic Corridor. Located on the shores of the Arabian Sea, it is about 533 km from Karachi and 120 km from the Iranian border and 380 km northeast of the nearest point in Oman across the Arabian Sea. Gwadar Port is owned by Pakistan government but operated by Chinese firm – China Overseas Port Holding Company (COPHC). Successful implementation of CPEC will be a game-changer for the people of Pakistan in terms of new economic opportunities leading to higher income and significant improvement in the living standards for ordinary Pakistanis. China-Pakistan Economic Corridor is a 15-year plan and will be completed in four phases: 2018 – Early Harvest; 2020 – Short Term; 2025 – Medium Term and 2030 – Long Term. The CPEC comprises of 51 projects. Chinese President Xi Jinping signed various agreements worth US$46 Billion during his visit to Pakistan in April last. Industrial parks and special economic zones are part of the China-Pakistan Economic Corridor memoranda of understanding agreed between the leaders of the two countries. However the key pre-requisite for the establishment of these zones are resolution of the energy crisis and building of a competitive infrastructure in Pakistan. The first phase of the economic corridor is focused on $45.6 billion worth of energy and infrastructure projects. China’s state-owned banks will finance Chinese companies to fund, build and operate $45.6 billion worth of energy and infrastructure projects in Pakistan over the next six years. Major Chinese companies investing in Pakistan’s energy sector will include China’s Three Gorges Corp which built the world’s biggest hydro power project, and China Power International Development Ltd. 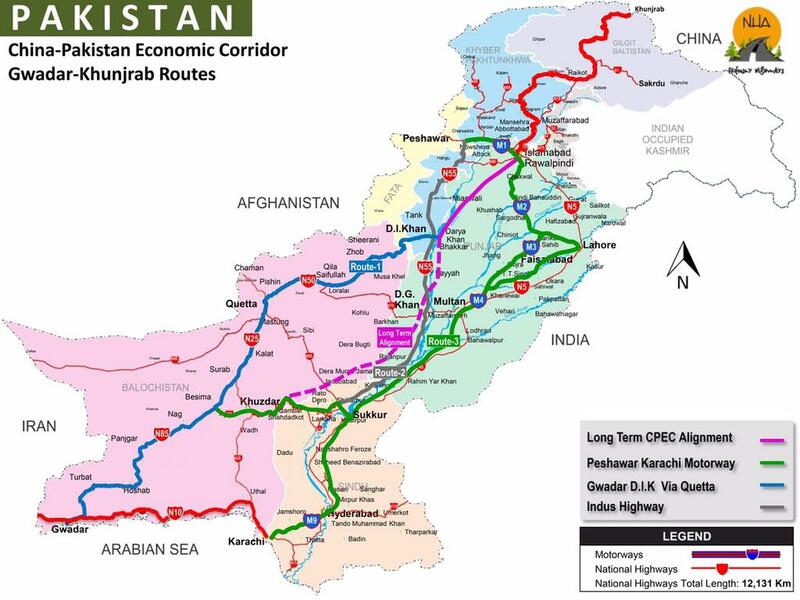 The transport and communication infrastructure – roads, railways, cable, and oil and gas pipelines – will stretch 2,700 kilometers from Gwadar on the Arabian Sea to the Khunjerab Pass at the China-Pakistan border in the Karakoram. Starting this year, the Chinese companies will invest an average of over $7 billion a year until 2021, a figure exceeding the previous record of $5.5 billion foreign direct investment in 2007 in Pakistan. Beyond the initial phase, there are plans to establish special economic zones in the Corridor where Chinese companies will locate factories. Extensive manufacturing collaboration between the two neighbors will include a wide range of products from cheap toys and textiles to consumer electronics and supersonic fighter planes. The basic idea of an industrial corridor is to develop a sound industrial base, served by competitive infrastructure as a prerequisite for attracting investments into export oriented industries and manufacturing. Once completed, the China-Pakistan Economic Corridor with a sound industrial base and competitive infrastructure combined with low labor costs is expected to draw growing Foreign Direct Investment from manufacturers in many other countries looking for a low-cost location to build products for exports to rich nations. A Special Security Division (SSD) is being set up for the China-Pakistan Economic Corridor, consisting of nine battalions of the army and six battalions of the civilian forces. According to reports, $250 million have been sanctioned for army force to guard Chinese personnel working on CPEC – $60 million annual budget. Earlier in March this year, Prime Minister Nawaz Sharif inaugurated the first phase of the Karachi-Lahore Motorway, which will facilitate people commuting between Karachi and other major cities of the country. Some observers are of the view that as part of its long-term planning, China has framed three corridor routes to overcome a greater security challenge in the South China Sea in shape of possible blockade of Sea Lane of Communications at the point of Straits of Malacca during conflict times. Any blockade may stop 80% of Chinese imported energy supplies from the Middle East and West Africa. It also wants to develop western hinterlands by heavily investing in these regions. The southern corridor begins from Guangzhou, which is the third largest city of China in South Central China. This route moves towards western parts of China and connects Kashgar with Pakistan at Khunjarab – a point from where China wants to link to Gwadar port in the Arabian Sea. It is the shortest and the most feasible option for China. But it is not the only option. The second Chinese option is the Central Corridor that starts from Shanghai and links the country to Tashkent, Tehran and onwards to Bandar Imam Khomeini Port of Iran on the Persian Gulf. One of its branches goes up towards Europe. This is the longer route but could be an option, if Pakistan does not deliver on the timelines of completing its road network to become a beneficiary of the New Silk Road Economic Belt. The third Chinese option is the Northern Corridor that starts from Beijing, passes through Russia, and links it to European cities. The fear of a maritime blockade imposed by the US in the wake of a conflict in East Asia has led Chinese thinkers to look for ways to bypass sea lanes subject to US naval dominance, writes Nadege Rolland, the Senior Project Director for Political and Security Affairs at the National Bureau of Asian Research (NBR) in his February 2015 article. In this backdrop, China and Pakistan signed a Memorandum of Understanding on China-Pakistan Economic Corridor on July 5, 2013. The agreement was signed during Prime Minister Nawaz Sharif’s visit to China. The CPEC, which will be built up to 2030, talks about integrated links to Chinese One Road, One Belt and 21st Century Maritime Silk Route. With active consultation of Chinese authorities, Pakistan has prepared a plan to construct three corridors, the western alignment, the central alignment and the eastern alignment. The last one has been picked for development in the first phase. The MoU on Long Term Plan of CPEC explains the rationales behind picking the eastern corridor. “Long-Term Plan should be developed under the principle of scientific planning, steadily developing, and take the easiest the first,” it states. It was on China’s demand for security and early completion of the route that led to the finalization of the eastern corridor. The western route, where the Pakhtoon and Baloch belts lie, cannot be developed at a faster pace and is riskier in terms of security. However, there is a counter argument that development would address the security concerns. The eastern alignment will pass through Thakot-Mansehra-Islamabad-Lahore and Multan. From Multan, the route will be linked to Hyderabad through Rohri and Dadu. The Hyderabad-Karachi portion will be linked through Karachi Motorway and then will be linked to Gwadar through East Bay Express Way along the coastal line. The work on central alignment will be completed later whereas construction on some parts of Gwadar-Dera Ismail Khan via Quetta route – western alignment – has already begun. I am wondering what will happen to CPEC project when Balochistan will gain independence. India will make it second Bangladesh. Baloch people are never going to let this project complete. China is getting stuck in a mess and there is no future of Pakistan. There economy is sinking and defense is now on China’s mercy and China is no one’s friend.